So mean hear beats per minute for these women are 75.9 beats per minute. The following distribution shows the daily pocket allowance given to the children of a multistorey building. The average pocket allowance is Rs 18.00. Find out the missing frequency. Clearly mean number of mangoes kept in a packing box is 57.19. Note: We have chosen step deviation method here as values of fi, di are big and also there is a common multiple between all di. So, mean number of days is 12.475 days, for which a student was absent. The following is the cumulative frequency distribution (of less than type) of 1000 persons each of age 20 years and above. Determine the mean age. 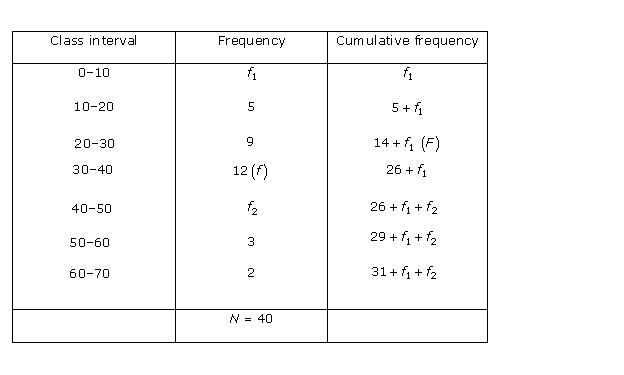 Here, we have cumulative frequency distribution less than type. First we convert it into an ordinary frequency distribution. 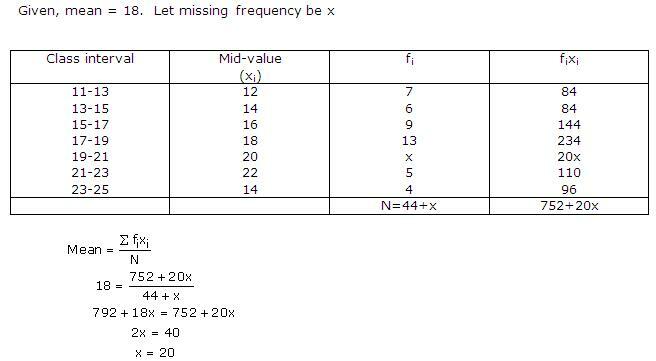 If the means of the following frequency distribution is 18, find the missing frequency. 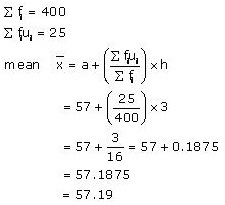 Find the missing frequencies in the following distribution, if the sum of the frequencies is 120 and the mean is 50. Find the mean daily income of employees. The median height of the students is Rs 167.13. You are given that the median value is 46 and the total number of items is 230. 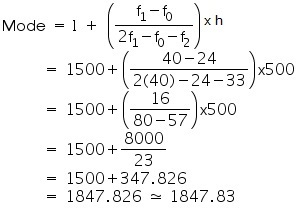 (i) Using the median formula fill up missing frequencies. 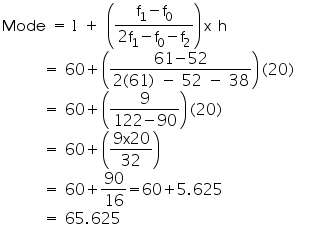 (ii) Calculate the AM of the completed distribution. The median of the distribution given below is 14.4. Find the values of x and y, if the total frequency is 20. The median of the following data is 50. 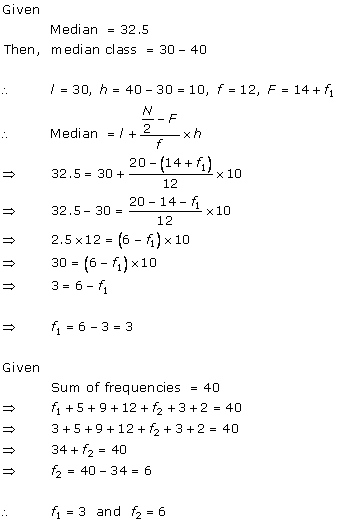 Find the values of p and q, if the sum of all the frequencies is 90. 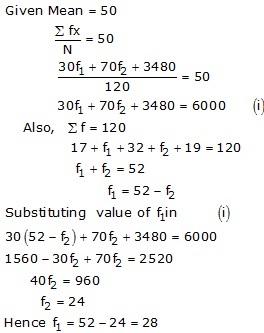 Now taking 30 as assumed mean (a) we may calculate di and fidi as follows. So, mean monthly expenditure was Rs. 2662.50. Find the modal agriculture holdings of the village. 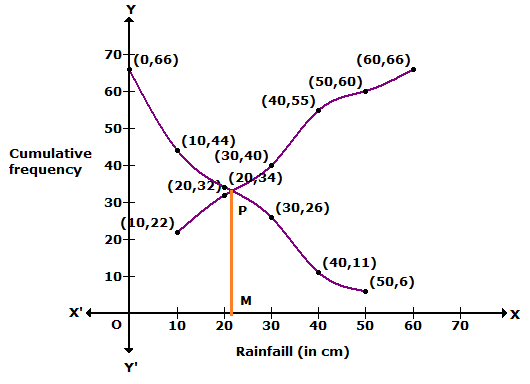 Calculate the median rainfall using ogives of more than type and less than type. We plot the points (10, 22), (20, 32), (30, 40), (40, 55), (50, 60) and (60, 66) to get 'less than type' ogive. We plot the points (0, 66), (10, 44), (20, 24), (30, 26), (40, 11), and (50, 6) to get more than ogive. 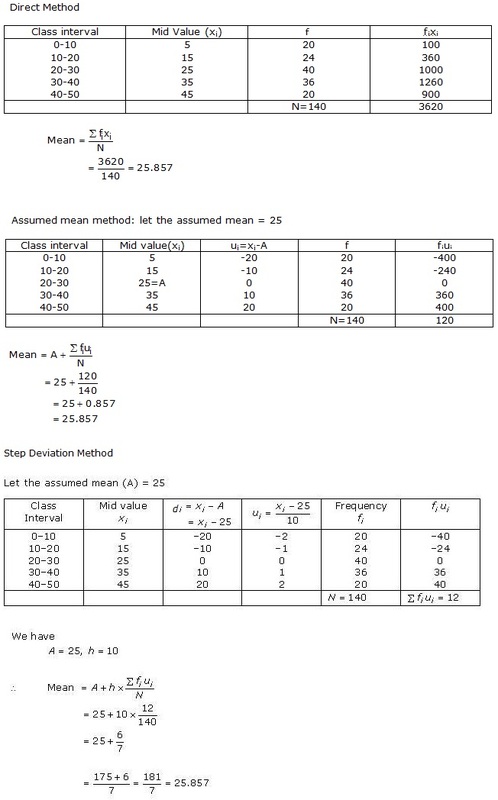 There are three main measure of central tendency the mode, the median and the mean. Each of these measures describes a different indication of the typical or central value in the distribution. The mode is the most commonly occuring value in a distribution. Median is middle value of distribution. While standard deviation is a measure of dispersion of a set of data from its mean. Which of the following cannot be determined graphically? Mean is an average value of any given data which cannot be determined by a graph. 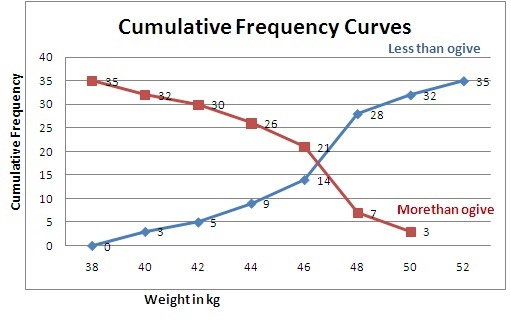 Value of median and mode can easily be calculated by graph. Median is middle value of a distribution and mode is highest frequent value of a given distribution. 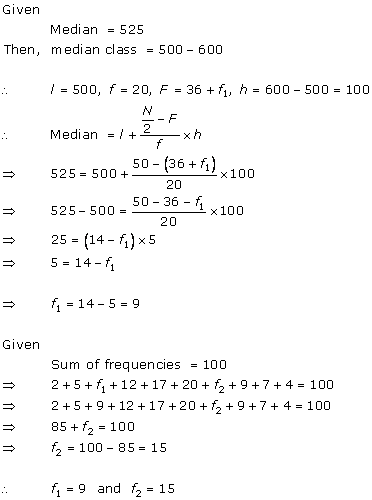 The median of a series may be determined through the graphical presentation of data in the forms of Ogives. 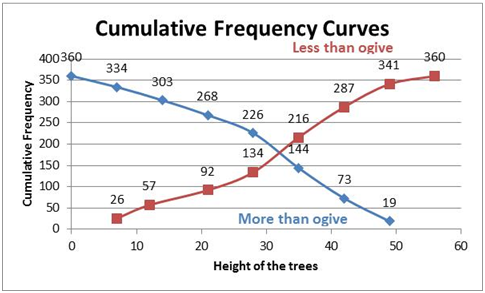 Ogive is a curve showing the cummulative frequency for a given set of data. Then the point of intersection of the two graphs gives the value of the median. Histogram is used to plot the distribution of numerical data or frequency of occurrences of data. Mode is the most commonly occurring value in the data. 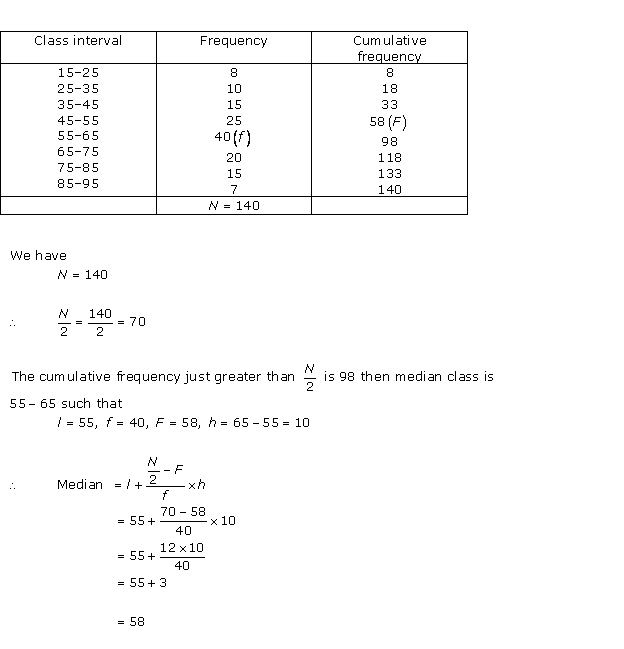 So in distribution or Histogram, the value of the x-coordinate corresponding to the peak value on y - axis, is the mode. Mode is the most frequent value in the data. 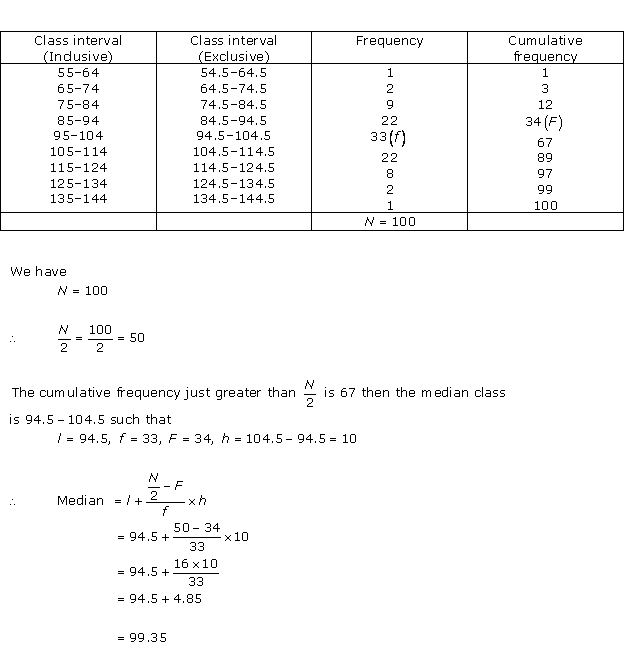 Mode is the value which occurs the most number of times. 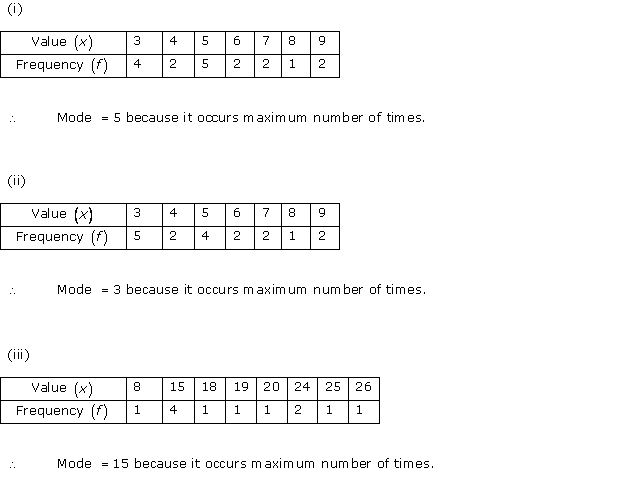 In the given data 48 comes twice and 43 comes twice but mode is 43. Hence if x = 43 then 43 comes thrice. In the given data 15, 16, 17 comes twice but given 15 is mode. Hence 15 comes more than 16, 17. This is only possible if x = 15.
a. evenly distributed over all the classes. b. centred at the class marks of the classes. 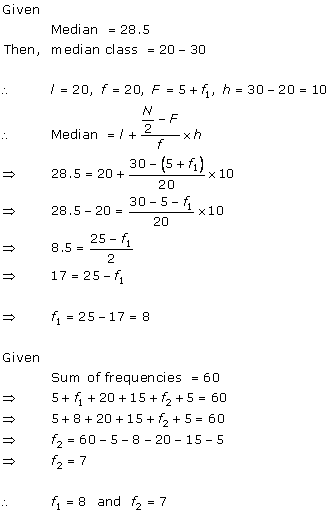 c. centred at the upper limit of the classes. 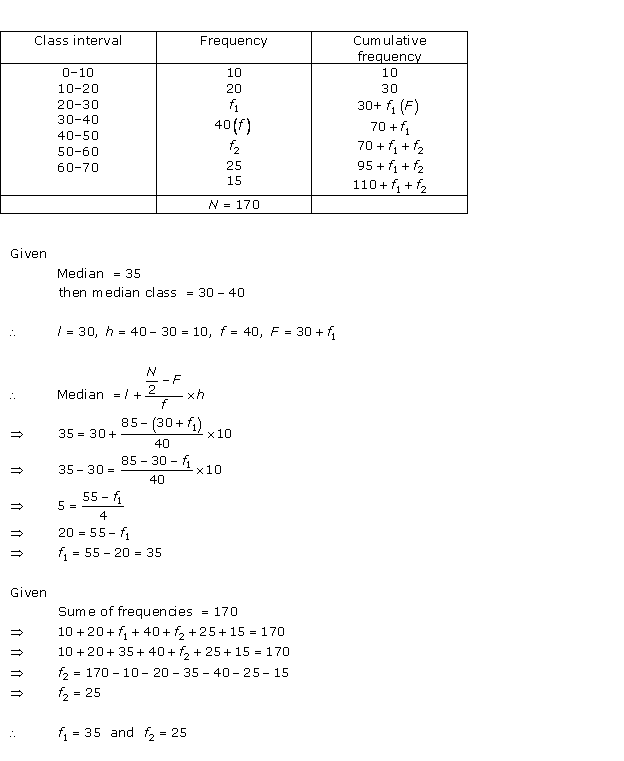 d. centred at the lower limit of the classes. 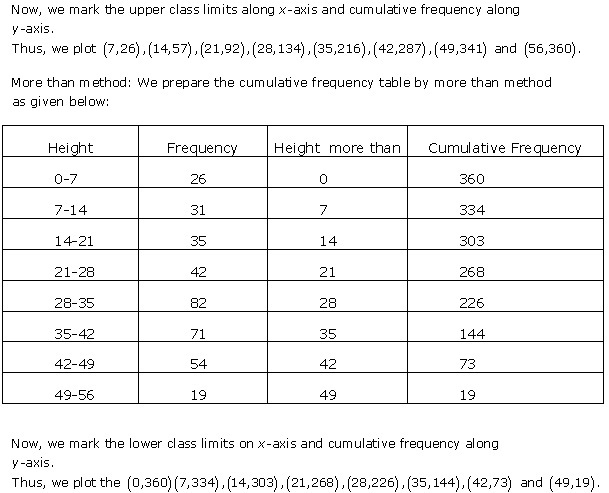 While computing the mean of the grouped data, we assume that the frequencies are centred at the class marks of the classes. di's are the deviations from a of mid-points of classes. 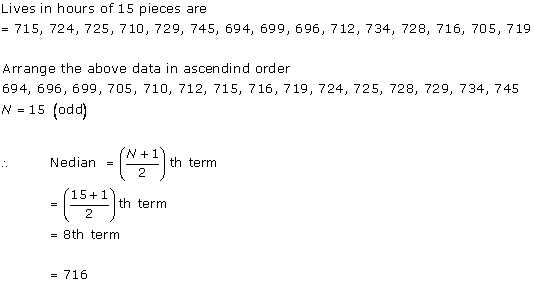 The abscissa of the point of intersection of less than type and of the more than type cumulative frequency curves of a grouped data given its median.